Biographies are a difficult genre to tackle gracefully, and graphic biographies especially so. Unlike fiction and even autobiographies, biographies require a deeply intimate understanding of the subject but also a rigorously sourced and researched understanding of history. 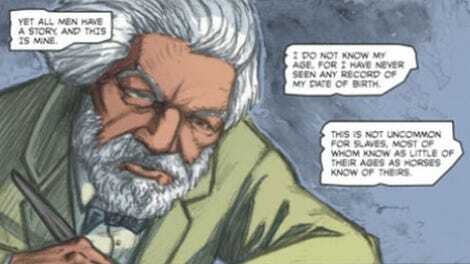 David F. Walker has shown in works like Shaft and Nighthawk the ability to place bombastic adventure comics in context of time, place, and identity, so seeing his name on the cover of a biographic graphic novel is exciting; historical context is just as important to nonfiction as it is to superheroes, if not more so. For all his name recognition and the numerous photos of the titular subject, the average reader won’t know much of what Walker explores in The Life Of Frederick Douglass. Douglass wrote multiple autobiographies and gave many well-documented speeches, but as with the majority of people born into slavery, there are missing pieces and histories. In an introspective and honest introduction, Walker discusses not only the sources he used to create the narrative of the book, but also how he struggled with the best way to frame it. Ultimately, using a first-person narrative from Douglass’ perspective does exactly as Walker aimed to do, highlighting the humanity not only Douglass, but of the people around him. It’s hard not to compare The Life Of Frederick Douglass to Che: A Graphic Biography; both are biographies of two men who stand prominent in their respective historical periods, their documented deeds tinged with myth. 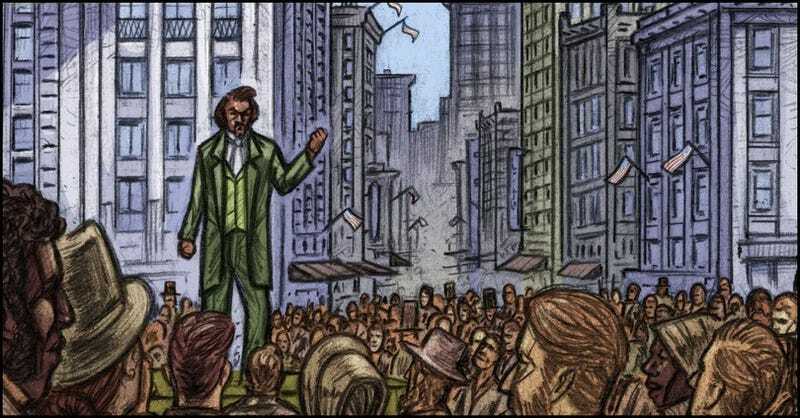 Damon Smyth’s art for The Life Of Frederick Douglass is loose and expressive, vibrantly colored by Marissa Louise, which serves to further link Douglass’ life to the reader’s. It’s easy to view photos from the 1800s or black-and-white illustrations and allow the lack of color to create distance between then and now, history and “real life,” which brings along with it an emotional disconnect. Explicit, straight -forward history lessons are interspersed throughout The Life Of Frederick Douglass, never shying away from words and slurs that many textbooks soften with allusions. In order to understand Douglass, it’s imperative readers understand the truth of the slave trade and the Civil War, and Walker provides that necessary context without sugar-coating or apologizing. Most importantly, Douglass and Walker both wrestle with nuance and internal conflict in a way that Che failed to do in any meaningful way. Douglass struggled with fear and self-criticism, and expressed justifiable frustration at the way white allies chose to support him and other black people. There is only one easy answer in the entire book, and that’s the central truth that slavery was an ugly, horrific, unconscionable way of being. Everything else is explored in layers of gray, circling around to questions about justifiable violence and the slide from slavery into what became segregation, then Jim Crow. That’s not all there is to this book, or Frederick Douglass. There are moments of profound personal joy, a deep well of affection and respect for his friends, and an all-encompassing, if private, love for his wife. Douglass is not just a historical figure to be reified and seen at a distance, but a man, entirely human and worth celebrating as such. Smyth and Louise’s lively, emotionally evocative art and Walker’s deft, intentional choices bring him to life and give him a new platform on which to speak to a modern audience.